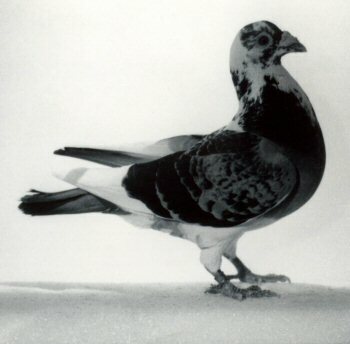 Mario Quagliata (1907-1995) was a champion pigeon racer. It all started out when his father gave him his first pair of birds in 1917, when he was ten years old. During his teen years, Mario had a few pigeons off and on, sporadically continuing his hobby. He met Josephine Muff when he was 19, in 1926, and a year later they were married. During the first few years of his marriage, Mario had to give up his pigeons because he didn’t have a coop for them. In 1932 he was once again raising and racing pigeons. In 1942 Mario and Josephine bought their house on 18th Avenue and soon afterwards Mario had a loft constructed above his garage. You can see the loft in the photo on the right (c.1945). 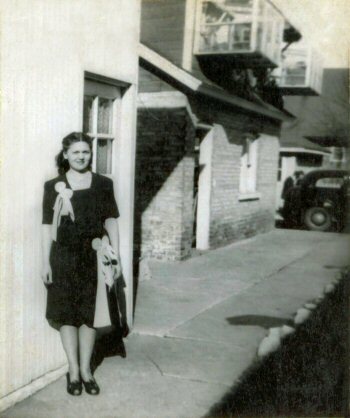 Josephine is standing at the rear of the house, next to the basement entrance, their car is parked in the alley behind the brick garage, and the loft can be seen on the second story of the garage.. In 2005, Chicago banned the keeping of pet pigeons. The ban was appealed to federal court which ruled in favor of the ordinance, making Chicago the only large US city that outlaws pet pigeons. However, in Mario’s time, from 1920s through the 1990s, Chicago was the Midwest mecca of pigeon racing. There were many clubs in the Chicago area and all kinds of races to enter. Mario belonged to the West Side Club and the Greater Chicago Combine. There was plenty of tough competition, but Mario's pigeons were consistent winners. The photograph on the right shows Big Al, one of Mario’s greatest champions. He won two First Chicago races in one year. Below is an image of the Racing Pigeon Bulletin which provided some of the information for this article. Big Al, one of Mario’s greatest champions. Sometimes, when Mario visited us in Saginaw, Michigan, he brought pigeons to a racer who my dad (Mario’s son Joe) knew. Mario raised the old Curtis Strain of Sion, the Bastian and the Stassart and crossed them with each other. In the 1970s, he began crossing his birds with the Van Riels, and after years of work, he had one of the best lofts in the US. His breeding birds were prized by pigeon racers all over the world. The photograph on the right shows another one of Mario’s grand champions - Dino. 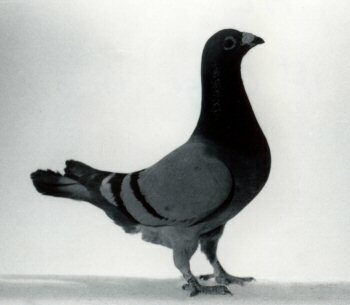 In 1973, Mario won second place in the Big Old Bird category of the Racing Pigeon Bulletin's 1973 Big All American Awards given for outstanding loft performance. That’s second place out of the whole US. As an example of how dominating Mario’s loft was that season, in one 492 mile race, Mario’s loft won the combine by one hour, won 1st club, and won 1st concourse average speed. Above is a scan of the Bulletin that I’ve altered by moving Mario’s article and photo to the front page so you can see the header in one scan. 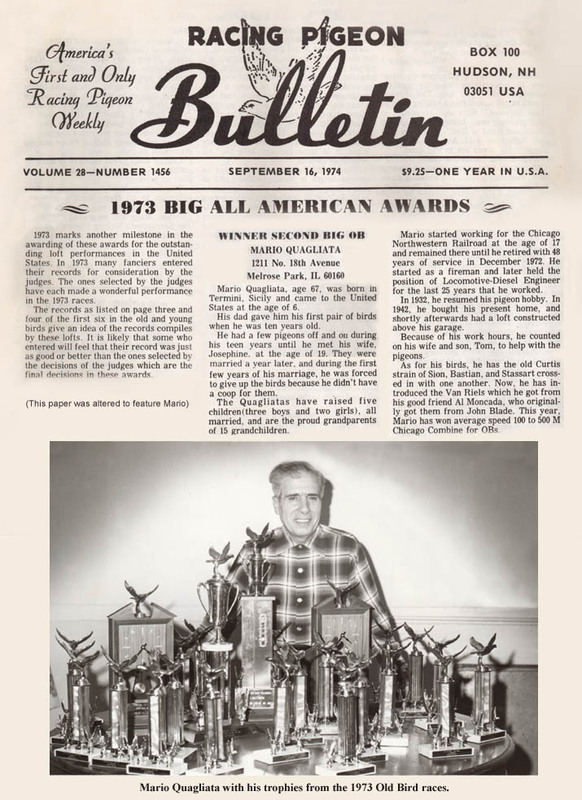 As you can see, his pigeons won many trophies in Old Bird races during 1973. Dino, another one of Mario’s grand champions.